The easy-to-use iWhite Tooth Polisher uses professional technology to help remove plaque and superficial stains from coffee, tea, tobacco and to prevent the build up of plaque. 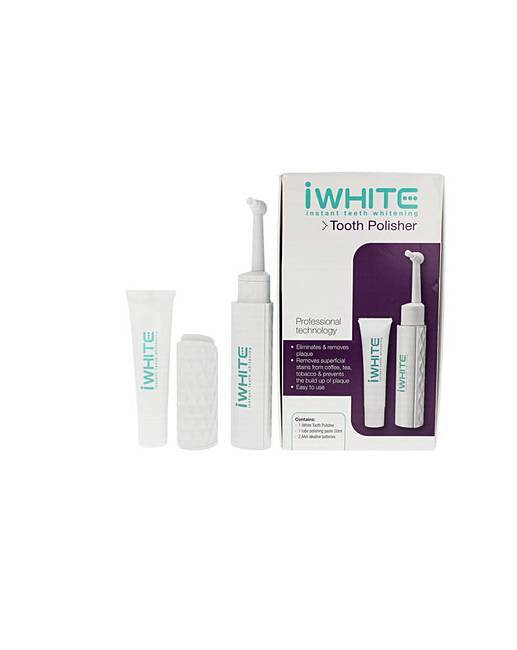 The iWhite Tooth Polisher can be used once a week. Place a small amount of the iWhite Polishing Gel inside and on the tip of the polishing cup and spread some tooth polishing gel over the portion of teeth you will be polishing. Hold the protect with your finger on the on/off button as shown on the picture. Place the rotating cup gently on each area of your teeth you wish to polish. Polish each area for a few seconds. Do not apply too much pressure. Reapply the iWhite Polishing Gel on polishing cup and teeth when necessary. Rinse your mouth after polishing the teeth.